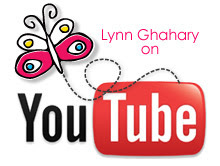 Lynn Ghahary :: Pieces of Me ...: Hip Hop Thursday! Anyone hungry for some Jillibean Soup? Happy Hip Hop everyone! Today we are celebrating the heroes in our lives and well it kinda goes without saying that my hero is my sweet hubby Salar. Not only is he an amazing father to our two boys but he is the most wonderful husband a gal could ask for. We've been together since we were 16 years old and he never ceases to amaze me. His heart is as big as his smile - he is so caring and sensitive and puts everyone before himself. I love you sweetie ... always and forever! Okay now I am totally switching gears with my layout today. LOL I had wanted to do this layout ever since I saw this particular image in the Confessions kit (UK-409A). Not sure why but it immediately made me think of this particular picture and then a certain saying and, well, it all kinda fell into place from there. Hee hee! The fun part of this layout (aside from the picture of my son spitting up in action LOL) is that all of the patterned papers I used on this layout were from my scrap stash. I had been cleaning it out and then went to create this layout and I just started pulling pieces that I thought would work. 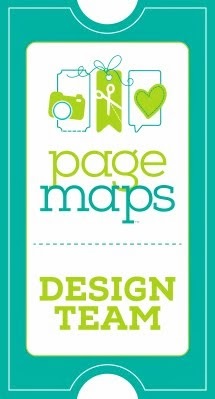 I challenge you to try the same with your next layout or card. 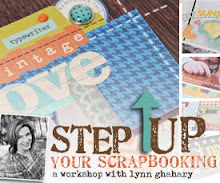 Just grab that stash of scraps you have and start putting pieces together - I bet you'll be amazed what you can come up with! Awww this is a cute layout!!! what a great hubby you have! thanks for sharing your story! What a cute family! What a cute layout. I just love how you captured this moment. BOBL!!!!! That's just hilarious!! I love that you scrapped this and shared it with all of us. Love your layout...just the everyday things that happen!! Love it!! ok, your layout is aawesome! i like the way you used that circle stamp. and your title....may all time favorite!!!! That is a crackup!! And sure, spitter upper can be a word. Why not?? Absolutely love layouts like this. They're my favourite kind, truly. Your layout is so cute! I love it! Oh I feel for ya! Both of my girls were spitter-uppers! I thought I'd wear the washing machine out before they were out of diapers!!! And guess what ~ they got so used of changing clothes ~ that they still like to wear several outfits a day! But at least now they help with the laundry! LOL! oh my gosh.. that is the cutest picture ever!!!! :) He is so adorable! This layout is so fun! Makes me happy! What a great layout!!! Love the title, too. So cute Lynn. Too cute!! I wish I would have taken pictures of my kids and their spit :) then I'd have proof!!! Such a cute layout...love that circle image...great use of it! Lynn, I just love this layout!! I can vouch as someone who works with babies everyday... Spit does happen!! I had a "spitter upper" too, so can totally relate to your adorable layout! OH MY WORD.... GIRL.... YOU ROCKED THAT LAYOUT! IT'S AMAZING LOOKING!!!! I LOVE THIS SOOO MUCH! SUBMIT IT...RIGHT AWAY! so perfect.. and that pic, omg priceless! I just love that layout!! What fun layouts - you've got a cutie on your hands. Great layout - I love how you scrapped that !!! this layout is awesome! i could totally lift it for both of my kids. they were/are both huge spitters! it's gross and i can't wait for silas to outgrow it. i made my niece a shirt that says "spit happens" when she was a baby because she was the exact same way. lol! great photo of your hubby! he has an awesome smile! 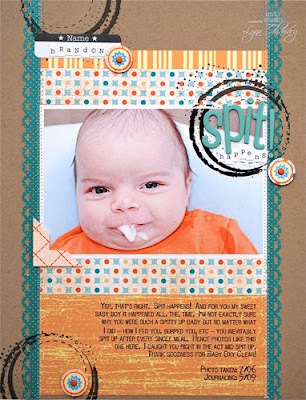 OMg what a cute LO.. and about spit.. too cute..
Too funny! You can embarrass him later with stories of him spitting up! :) And I just love your attention to detail. You are my kinda scrapper! this is an awesome layout lynn! that photo is hilarious! i have one with a previous daycare boy when he was just learning to crawl ... and i just happen to snap a picture mid spit-up. it was hanging all the way down to the floor. i wanted to enlarge it for his parents. lol!